Benjamin Lauren is an Assistant Professor of Experience Architecture in the Department of Writing, Rhetoric, and American Cultures at Michigan State University, where he serves as Assistant Director of the MA in Digital Rhetoric and Professional Writing and as a HUB for Innovation in Learning and Technology Fellow. His book, Communicating Project Management: A Participatory Rhetoric for Development Teams was published in the ATTW Series by Routledge. For more information about Ben’s work, visit benlauren.com. William Hart-Davidson is a Professor in the Department of Writing, Rhetoric, & American Cultures and Associate Dean for Research & Graduate Education at Michigan State University. Re-reading Ulmer’s take on “flash reason” resonated with us, so allow us to get right to the heart of the matter: we all could use a little more groove. Learning how to groove is a good thing. There’s not much groove on the radio these days. And there’s precious little on social media platforms. In both spaces, an alternative to groove has become the norm: the grid. You’ve no doubt heard the grid before. Each beat is perfectly placed and carefully constructed by an algorithm. And while there are virtues to the four-on-the-floor House beat of electronic dance music and other similarly tight rhythms, a serious downside is the way they limit engagement and participation. It’s no wonder the listener falls into a trance. Isolated. Responses register as ‘likes’ on someone else’s platform. Prudence and judgement are overdetermined by a menu: heart, smiley face, thumb. But a groove is different. Musicologists have gotten serious about theorizing what makes a groove, and what they say will feel right in the pocket for rhetoricians. A groove is a shared experience made possible by a structural performance and an embodied response. One cannot groove alone (Can I get it on the good foot?). We make a groove first by feeling out a pattern and second by making space in that pattern for a listener to join in. The pattern occasions Cicero’s breakdown of phronesis: memory, foresight. Anticipation (Hariman, 2009). The space invites listening, reflection, action. It evokes participation. We feel the groove when we listen as an invitation to make the very thing we hear. Whether we physically clap along with a beat or just nod along, we listen for our space(s) and fill them in. For musicologist Maria Witek and her colleagues (2017), this accounts for the groovy power of syncopated rhythms. They leave space for listeners where accents go. Musicians lay back in genres like funk, or re-make the grid on the offbeat as in ragtime, giving the prime spaces to listeners to feel and fill (Witek, 2017). Musicians and audiences, together, approach the sublime by discovering the groove makes space with a steady pattern. It is the absence of a beat that makes space for another to join. What might it look and sound like to make a groove? An act of electracy, an exercise in learning to make patterns of anticipation with space(s) for participation? We draw on Halbritter’s (2012) concept of a “multidimensional rhetoric,” asking the learner to deliberately engage multiple modalities of electrate writing: the visual, the aural, the textual. We find that staging an act of composing in multiple modes or, as in the groove assignment below, in a mode that offers a deliberate contrast (visual) to the dominant one (aural) for a given genre, prompts learners to dwell on the abstract rhetorical capacity they are drawing upon and developing. Moving from aural to visual and back again helps learners extend the range of rhetorical dexterity they can call upon in the future as well, and this is often the rationale for such exercises. But we find it just as interesting the way that practicing multidimensional rhetoric allows the learner to highlight the key moves and how they may or may not jive with expected norms, conventions, or stylistic precedents. In what follows, Ben is the instructor and Bill is the student. As a songwriter and as a writer, you will often be charged with crafting a theme for a piece and composing accompanying music or assembling scholarship in support of that theme. You also, at one point or another, have to decide on a groove or what we can think of as the feel of the piece. As writers, we consider the feel as made up of rhythm, tone, or just general decisions made about style (including word choice). This project will help you develop a better sense of groove as a kind of decision-making process that gets represented by the phrasing and feel you develop. Make a groove that presents a certain kind of feel or conveys a specific emotion or embodied state of being. The groove must not just make space for you, but also for your audience. To get started, choose an instrument or instruments to compose with. Listen to how other songs develop a groove and make space for participation, and model similar approaches. Capture your ideas using a low-fi recording device, like your phone. Then, once you have a groove generally crafted, begin the process of recording it for others to hear. This process will consist of several steps, such as choosing a tempo, building a drum track, and playing over the track to establish a feel. The groove you make should mind musical patterns, tempo, and scale. In this way, you may need to edit your groove to capture a performance that you believe represents the sound and feel in your mind and your body. That may take some exploration, trial, and error, but once you capture that sound, be ready to share it with others--including me, so we can work together to identify how much space the groove provides to others. The challenges of making a groove lie in finding structures that invite the kind of involvement from an audience that we seek and performing it in a way that invites participation. To do this, we have to lay down an interesting pattern with the right kind of space. And then we have to keep the space clear, open, enticing. It is not easy to do. The below track is Bill's first draft of the assignment. Ben heard a tempo that was perhaps too quick for the bass pattern. So that was the first question: why this fast? Bill’s answer betrayed a readymade, a drum loop he had used for the track that came stock at 111 BPM. The drum readymade functioned, as Ulmer predicts, to scaffold a funky, syncopated groove. It ‘models how to write in electracy’ as Ulmer notes, by evoking a larger context of contemporary music. In doing so, its various features that might be manipulable can nonetheless remain obscure to a novice listener as it appears smooth, of one piece, an object. It is none of those things, essentially, for a more practiced groove maker. Bill and Ben heard another dynamic in this first version that both agreed ran counter to the ethic of a groove. Bill heard it as rushing. Getting ahead of the tempo while playing, making the rhythm sound off. Ben directed Bill to check this aural intuition by shifting modalities. Looking at the waveform together, Ben showed Bill how to drag the bass track along the grid in those places where he got ahead of the one, the first beat of the bar. Screen Capture from Digital Audio Workstation Ableton Live showing waveforms for two audio input channels recorded for the first version of Bill’s groove assignment. The image above is from a digital audio workstation (DAW) called Ableton Live. The top waveform is the Bill’s bass signal on take 17. The bottom waveform is the drum loop. If you look where the bar lines are, you can see in the bass signal where Bill anticipated the one in several spots. Reading this, rushing a funk rhythm by clobbering the one is...well...rude. Filling in that accented beat should be an opportunity left for the listener. It is something like cutting in line or a host serving himself first, a break in decorum. The breach is a denial of participation. Presumption. Doing the thing for the listener rather than laying back, letting the thing get done. Ben’s final comment for Bill on this draft was to use Ableton to edit the track. Ben’s advice was to slow the tempo down to 92 beats per minute from 111, a step Bill could take simply by entering the new number into a selection box and hitting enter. He would not need to play the piece again and record it more slowly. 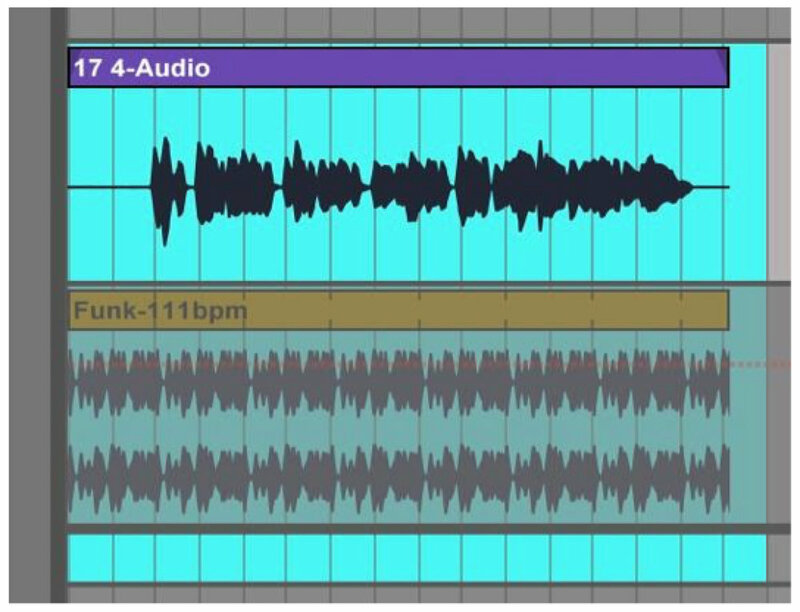 Ben also asked Bill to perform some edits inside Ableton’s “arrangement view,” where the waveforms that represent the bass and drum tracks are represented on a grid. Using this view, Bill could click and drag the bass waveform back to where he thought it should go relative to the bar lines, effectively aligning the music to the drum track. This served to fix the rushing problem and to help Bill hear the right space in the groove. Ben then asked Bill to listen to the edited track over and over, until the new edits no longer felt like isolated choices but became the way he was feeling the rhythm of his bass part in relation to the drum sample. Ben also asked Bill a leading question: what else could make the track groove? After he felt he had an answer, Bill was to record his piece again, trying to get the new feel into his own playing. In other words, he was to make a revision. Here is the revised track. Screen Capture from Digital Audio Workstation Ableton Live showing waveforms from version one (left) and version two, revised (right) of Bill’s groove assignment. One significant change in this version that emerged is in the riff at the end of the phrase, a syncopated descending line of eighth notes. Bill changed the line to echo the snare pattern in that spot. Now compare the waveform on the left, which is the first version, with the one on the right where the drums and the bass are both holding the space open together. Much groovier, no? In the evaluation of Bill’s work, Ben sought to focus on this higher-order reasoning and to use the details of the practice to understand where Bill might have learned something valuable, transferable even, to a broader rhetorical repertoire. Ben’s goal was to provide a method for Bill to quite literally see how groove looks when it is recorded in a digital audio workstation. In this way, Bill was able to note that it is both the timing and alignment of rhythm, but also the spaces between notes and patterns. You can hear that in Bill’s revision of the composition, where he begins to add phrasing that mimics the drum loop, leaving space for another to participate. In other words, Bill’s understanding of the feel had become more nuanced, perhaps minding what Kyle Stedman (2018) recently surmised about analyzing and critiquing sound via technology like DAWs: “I don’t want to try to understand something I’ve never let myself feel” (par. 7). So what did Bill realize here? It seems clear that he came to a realization that it is important, in this groove, that the bass line evolved from draft one to draft such that it echoed the rhythm of the snare fill. The valuable lesson here is one that is often reduced to a cliché for bass players: listening to the drummer is crucial. But here we see that truism played out with considerable specificity. Listening and playing with the drummer here is about not muddying up the signal in a key moment of making space (as the loop repeats and we get the big build up to the one of the phrase). In the first cut, as the waveform shows, Bill put a big sonic smear over the precise, staccato invitation to the listener laid down by the funky drummer. Ben’s coaching of Bill to engage in repetition – of playing and listening – calls to mind Casey Boyle’s concept of “serial practice” in which there are not, or not always, planned pauses for reflection but instead a kind of momentum toward (and perhaps faith in) a realization, over time, of a better way to arrange things. Ben knew what Bill had to do, but he did not know where he would go or what the repetitions he asked Bill to engage in would produce. The point was to get lost in the details of the thing and theorize at the point of that practice rather than to reflect on the meaning of it more broadly. As a musician who had learned this way, Ben had confidence it would lead Bill to new places in his composing and in his playing. In the end, seeing the visual representation of the waveform helped Bill understand why the earlier phrase in the bass line (top image) is, while not “wrong” in a rhythmic or melodic sense, imprudent in this groove. The reason is that it violates the convention of making space for the listener, which Banks reminds us is the signature ethic of funk. It rushes in and fills that space instead of hanging back. It sounds wrong to the ear because it is something of a faux pas, an ethical breach. In Ulmer's terms, the earlier draft showed poor judgement – not unusual for a learner, perhaps, but nonetheless a cause for reflection and revision. The judgment was not just aesthetically poor either, but was rather a violation of the terms of decorum that define a funk groove. Bill risked denying the audience their moment (on the one) to play along. Aldave, Cherryl. "Clyde Stubblefield: The Funky Drummer." Wax Poetics, 2003. Banks, Adam. "Funk, Flight, and Freedom." Chair’s address on the future of the conference on college composition & communication. Transcript accessed April. Vol. 27. 2015. Boyle, Casey. "Writing and rhetoric and/as posthuman practice." College English 78.6 (2016): 532. Clinton, Ernest JG. Funkadelic: One nation under a groove. Altaya, 1998. Halbritter, Bump. Mics, Cameras, Symbolic Action: Audio-Visual Rhetoric for Writing Teachers. Parlor Press, 2012. Hariman, Robert. "Prudence/performance." Rhetoric Society Quarterly 21.2 (1991): 26-35. Stedman, Kyle. “Analysis vs. Experience; or, Another Written Piece About Sound.” Media Commons: A Digital Scholarly Network. March 2018. http://mediacommons.futureofthebook.org/question/how-do-digital-media-and-technologies-allow-closer-critique-and-analysis-sound-what-relat-6. Accessed April 23, 2018. Witek, Maria AG. "Filling in: syncopation, pleasure and distributed embodiment in groove." Music Analysis 36.1 (2017): 138-160. Witek, Maria AG, et al. "Syncopation, body-movement and pleasure in groove music." PloS one 9.4 (2014): e94446.